A couple weeks ago, I wrote about hiding Google doodles in Chrome using a bit of CSS. 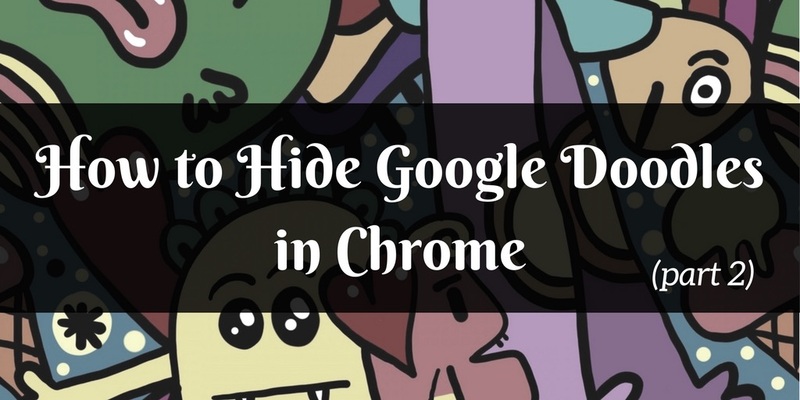 I talked about several ways to hide Google Doodles using other extensions you might already have installed, and then about my own Chrome extension called Hide Doodles. I really wanted to just use CSS for some reason, but it wasn't enough to do the job the way I wanted to do it. If I had just hidden the logo, it would've worked easily - but I didn't want to leave a blank area. If I waited until the entire page (aka DOM) loaded to replace the element, however, it could create a choppy effect as the element was replaced. So I opted for the arrive.js library, which uses mutation observers to monitor for the arrival of an element. The moment the element (the doodle) arrives, I replace it. So far, the effect seems to be unnoticeable. // monitor for the arrival of the doodle element, which has an ID of "lga"
But replacing the doodle with what? Here's the snippet I wrote to handle the main search page. There's no reason to run both of the above scripts on any single page though, as each element ("lga" and "logocont") occurs on a separate page. Enter the manifest.json. When you create an extension/app - in Chrome, Firefox, a mobile phone, etc - there's nearly always a file where you can request how and where your extension should run. For Chrome, it's the manifest.json file. Not enough extensions use it properly, so an extension that only needs to run on one site might end up prompting you to give it access to all sites. I created an exhaustive list that matched on certain patterns for every google domain available (there's about 200 of them). The main search page is matched in the first "matches" block below (anything on a google domain without a path, or ending in "webhp", which occurs when you click the small logo on the search results page). The search results page is matched in the second block (anything on a google domain ending with "search"). I told it to run the scripts at "document_start", which injects the files before any other DOM is constructed or any other script is run, to make sure that arrive.js is monitoring for the element before it arrives. You can check out the rest of source code on GitHub or grab the chrome extension from the store if you'd like. Feel free to let me know if you see any strange behavior, but so far it's been working like a charm. And if you'd like to write your own Chrome extension, I wrote a brief introduction.